The industrywide driver shortage remains a pressing issue. American Trucking Associations this year has reported it at more than 50,000. Once again the driver shortage ranked No. 1 on the American Transportation Research Institute’s critical issues report, which was released Oct. 29. There was a need for 60,000 new drivers in 2018 alone, according to Lana Batts, co-president of Driver iQ, a company that specializes in background screening for the trucking industry. Batts spoke at the Women In Trucking Association’s annual conference Nov. 14. KEY TO RETENTION? Listen to your drivers. Besides grappling with a slim supply of drivers, the industry faces an aging workforce. 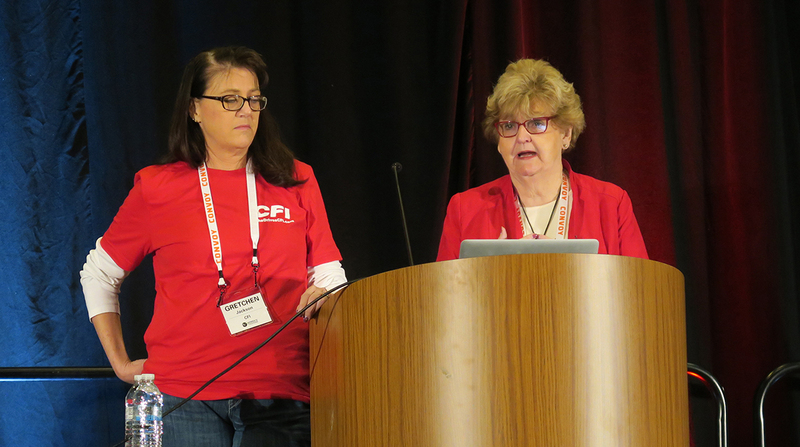 Gretchen Jackson, a senior manager for driver recruiting with CFI, said that the bulk of drivers are middle-age, and 20% are between 55 and 64. Batts said that 49% of the turnover that will come in 2026 will be because of retirements. In 2022, some 32% of the workforce will be older than 65. To maintain drivers, Jackson said companies need to offer local options for those who don’t want to be away from their families for long stretches of time. Young people present a solution to offsetting the driver shortage, according to Batts. However, federal law does not permit 18- to 21-year-olds to drive Class 8 trucks across state lines, although 48 states allow people in this age range to drive intrastate. Batts’ research indicated that 55% of the truckload industry said they would support younger drivers making interstate runs. However, only 52% said they would hire drivers that young. Batts’ research shows that turnover is increasing for larger carriers but declining for smaller ones. Jackson said one reason for this dichotomy is that small private carriers often offer a sense of personalization that can get lost with larger companies. For example, she said leaders at smaller fleets with fewer employees recognize and notice their workers. She also said that private carriers generally can offer more home time and attractive uniforms. Batts pointed out that strong economies usually mean a higher turnover rate. Although the unemployment rate is low, the “quit rate” is high because people either have lined up a new job or are confident they can find another one quickly. Batts mentioned an analysis from the Upper Great Plains Transportation Institute that studied 15 carriers and found that the average cost of turnover was $7,900 a carrier. She said that the average cost of turnover for the truckload industry is $11 billion a year. Some leading reasons for turnover are concerns over compensation, time away from home, lack of communication and the unpredictability of pay rates. Jackson pointed out the double-edged sword of drivers who get paid for how many miles they drive and balance a family life. When those drivers take time to spend with their families, they are not getting paid. Twenty-five percent of carriers offer weekly compensation no matter what, which can take the form of guaranteed miles or a guaranteed paycheck. “The wheels aren’t turning, and they’re not earning,” Jackson said. Jackson also cautioned against sign-on bonuses, which often include provisions such as running team loads and driving for 30 days without home time that prospective drivers miss when signing on to work. Jackson compared them to shiny pennies that attract people but contain undesirable requirements.